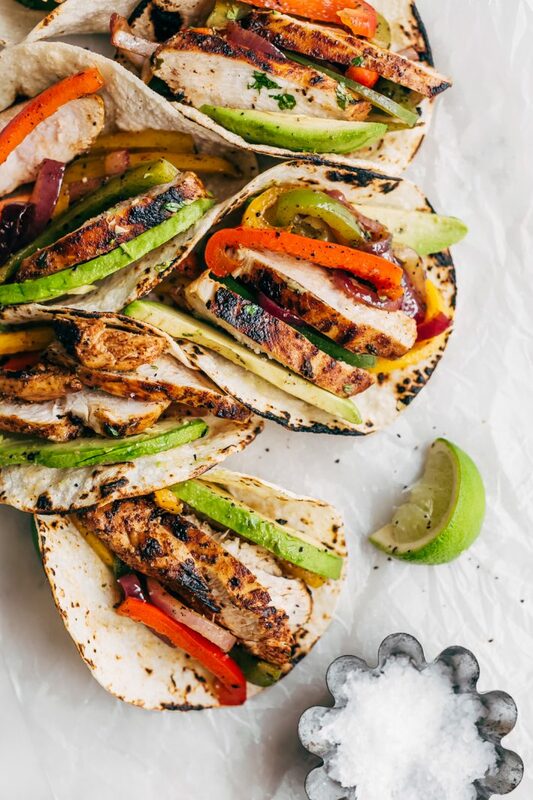 Learn how to make really flavorful chicken fajitas as home! This is my take on the tex-mex chicken fajitas and the flavors are incredible! I can’t believe it took been two years since I last shared a fajita recipe with you. I first shared my steak fajitas recipe over two years ago, and now I’m happy to say I’m bringing a version to you today that’s been tweaked a bit so that the flavors work better with chicken. Chicken fajitas were my favorite thing my mom made growing up. I take that back. They were one of my favorites. That’s more accurate. Mainly because it was chicken, peppers, and onions stuffed into warm tortillas and the topping possibilities were endless! My mom made them the way most people do, with a simple seasoning packet and for years, I made homemade chicken fajitas the same way, but that’s certainly not the case anymore! 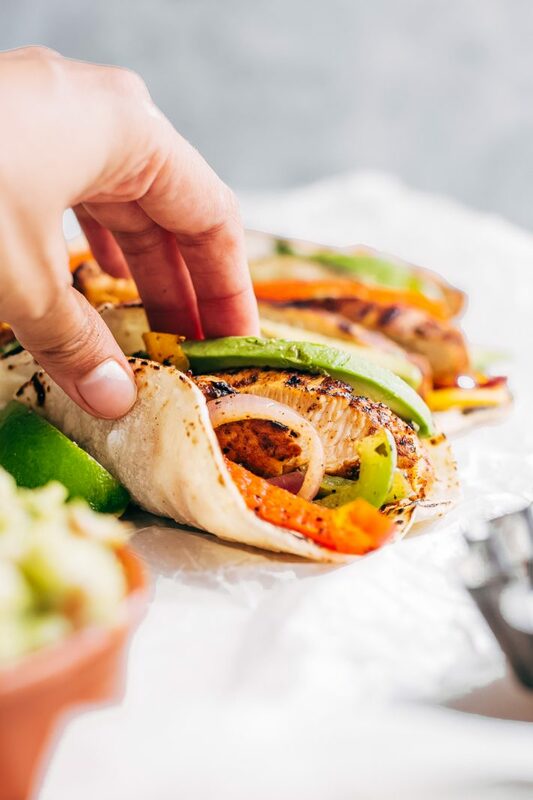 When you make your own homemade chicken fajitas marinade, the chicken is a billion times more flavorful, and you get to control the heat level too. 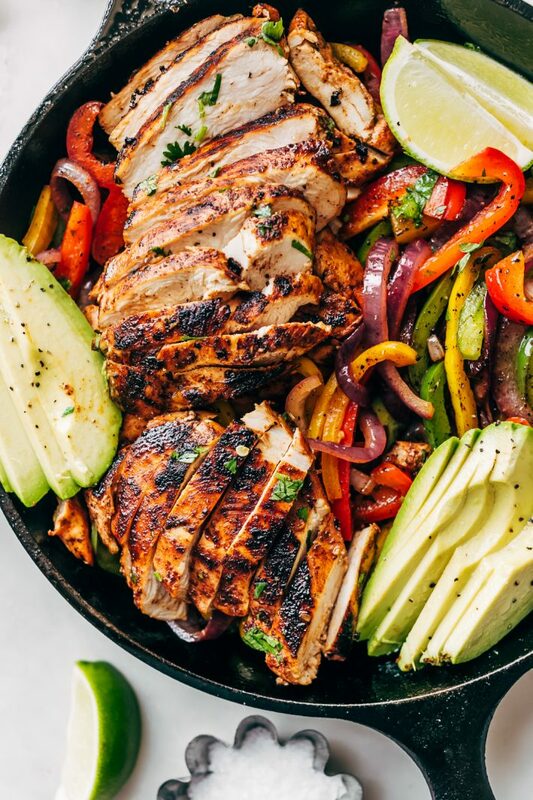 If you’ve made and loved my steak fajitas  (the way sooo many people have,) you’re going to love today’s chicken version! My recipe for homemade chicken fajitas starts with the chicken marinade. 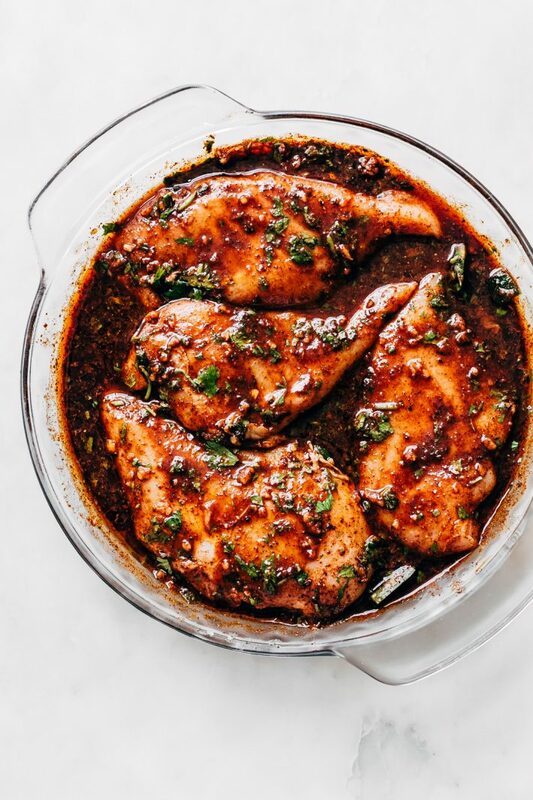 Unlike the seasonings packets which you just pretty much dump onto chicken breasts, and toss it into a pan, we’ll be allowing the marinade to really soak into the chicken so that it’s flavors everything perfectly. Trust me! These are some of the best chicken fajitas you’ll ever have and I wouldn’t say that if I didn’t mean it. This recipe makes a ton of chicken fajitas! Enough to feed 6-8 people and you can certainly cut the recipe ingredients in half if you don’t want to have so much around. 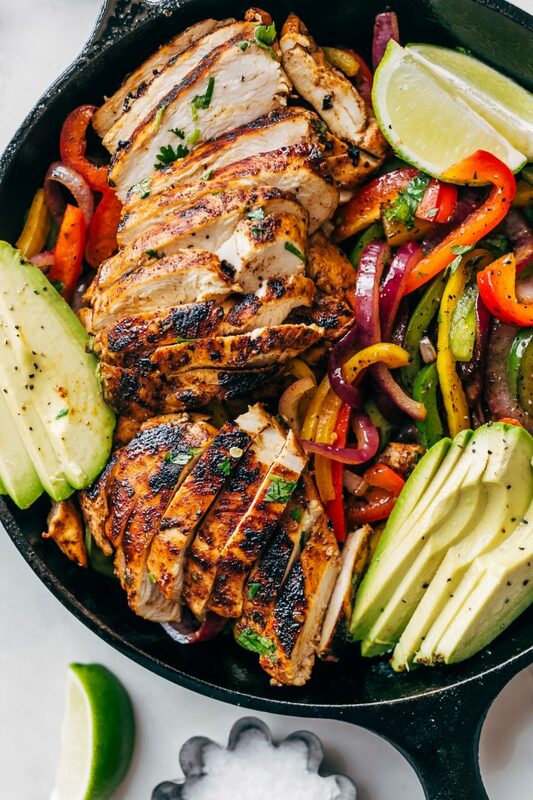 I always like to marinade a ton of chicken for my fajitas because we turn the leftovers into Chipotle-style burrito bowls for lunch the next day. This also works well for meal prepping because unlike a lot of meal prep recipes, chicken fajitas actually taste better as they sit. You can serve the fajitas over a salad or on top of quinoa if you decide to meal prep them for the week. The ingredients for my chicken fajitas are very similar to the ones I use for the steak version. I’ve just added a couple of additional components that pair well with chicken. You might be wondering why I use pineapple juice to flavor the fajitas. Pineapple juice, the good stuff that has no added sugars is what you’re looking for here. 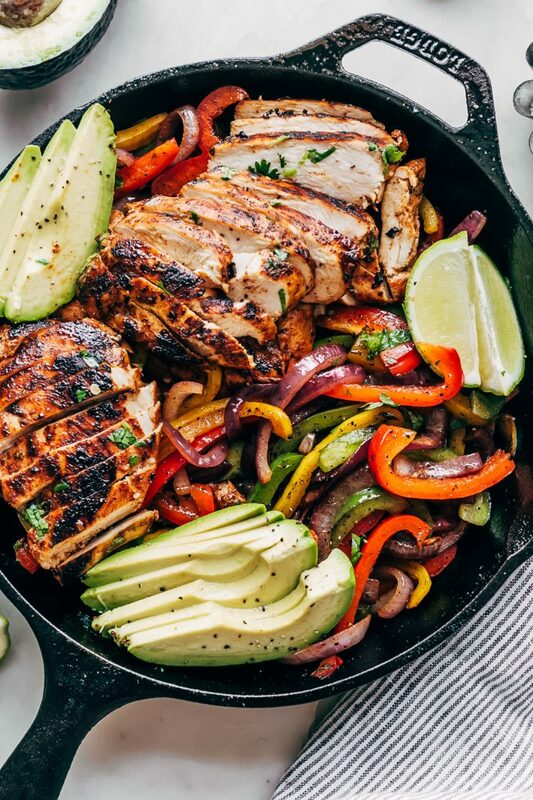 Store-bought fajitas seasonings usually contain enzymes that help tenderize and break down the chicken, so you’re left with tender chicken in every bite. Pineapple juice goes the same thing here, and it’s a natural ingredient. I’m not too comfortable with some of the stuff that’s labeled as ‘meat or poultry tenderizer.’ Not sure what’s in it because they almost never label those kinds of things. If you aren’t a fan of pineapple and are wondering if you can taste it in the chicken once it’s cooked, the answer is no. Not at all. It just does it’s thing and doesn’t even leave a trace. Let’s talk about the chicken here for a second. I used chicken breasts, but I could see this recipe working well with boneless, skinless chicken thighs too. You guys know that’s not my thing, but for someone who prefers dark meat chicken, this would be the ideal thing to use. 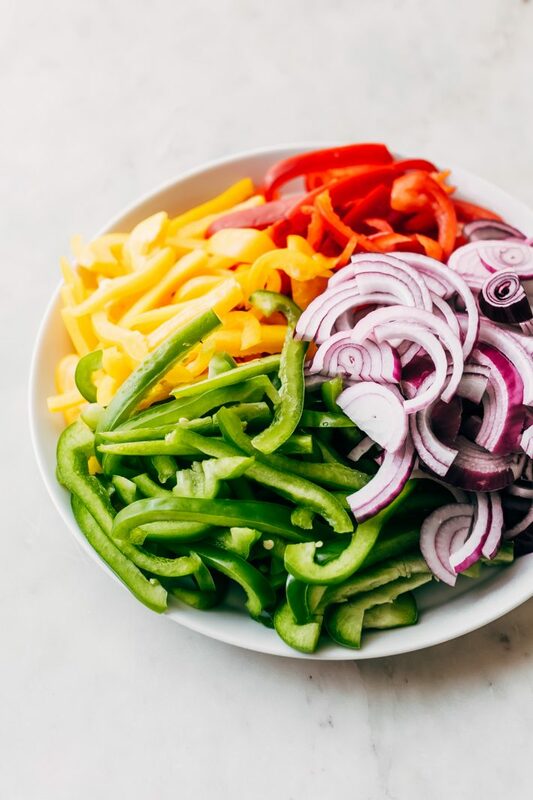 We’re going with pretty standard stuff here – sliced peppers and sliced onions. Use an array of pepper colors here; it only makes the meal look that much more appetizing! I like to use red onions with chicken fajitas and white or yellow onions when I’m making beef fajitas, however, whatever kind of onion you have will work here. If you’re familiar with my steak fajitas recipe, you know I like to use sliced poblano peppers along with bell peppers. I opted to go the full bell pepper route here, however, you could also substitute green bell peppers for a poblano if you’d like. You’ve got a few different options here. grill them outdoors. You can simply toss the chicken onto a preheated outdoor grill and let it cook through on both sides . The sliced peppers and onions can go into a grill basket. grill them indoors. Here’s  (affiliate link) the grill pan I use when I want the chicken to get those beautiful grill marks on it. You can also cook the veggies in the same pan. use a cast iron skillet. This is my favorite way to cook fajitas. I use my regular old cast iron skillet  (affiliate link), and it never does me wrong! Once I remove the chicken, I add about half of the veggies to the skillet and cook them with a drizzle of the chicken marinade until they sear and brighten a little bit further in color. For serving you’ll want to grab flour/corn tortillas, guacamole, guacamole salsa , salsa , sour cream, and shredded cheese. When I make burrito bowls, I start with homemade garlic lime rice , top it with the cooked fajitas and then comes the fire roasted corn, guacamole, double the salsa, a dollop of sour cream and a generous sprinkle of shredded cheese. Fully loaded is how I like my chicken fajita bowls. And there you have it! Don’t think twice here, marinate that chicken and make this. 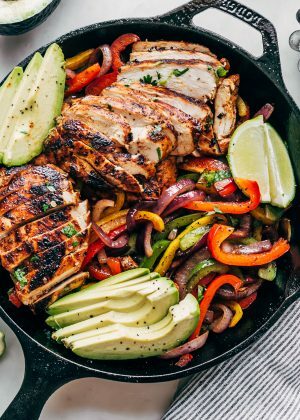 Hope you love my homemade chicken fajitas recipe as much as we do! to serve: tortillas, homemade guacamole, guacamole salsa, salsa, sour cream, cilantro lime rice, sautéed corn, shredded lettuce, and the list can go on and on! MARINADE: combine the ingredients for the marinade along with 1 ½ teaspoons salt and ½ teaspoon black pepper. Use a whisk to combine before adding the jalapeño slices and the chicken breast. Let marinate covered in the refrigerator for 4-6 hours. Remove from the refrigerator and allow the chicken to sit at room temperature for 30 minutes before cooking. Set a large cast iron skillet or nonstick skillet over high heat and let heat up for a couple of minutes. Drizzle in a teaspoon of oil and add half the chicken to the pan and cook on each side for about 3-5 minutes or longer depending on the thickness of the chicken. If the pan becomes too hot, reduce the heat to medium-high. Remove the chicken from the pan and allow to rest for several minutes. Slice the chicken into thin slices. FAJITA VEGGIES: Add another teaspoon of oil to the pan over high heat, add half the onions and bell peppers. Let the veggies begin to sizzle and toss as necessary. You can drizzle in some of that chicken marinade if you want to flavor the veggies but be sure to cook them well. Season with a pinch of salt and pepper. Remove the veggies to a plate and cook the remaining veggies the same way. ASSEMBLY: Serve the chicken fajitas in tortillas or on rice bowls topped with your favorite toppings!